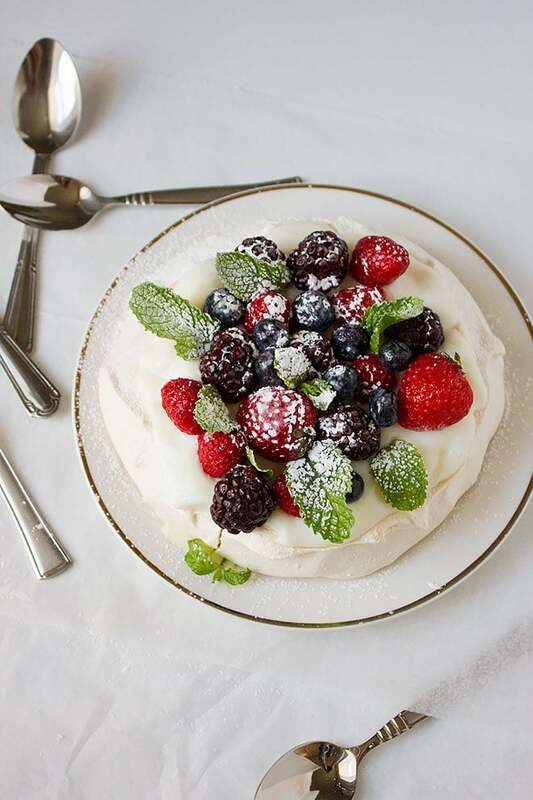 Like you, I never thought I’ll ever make pavlova. I heard about how delicate this dessert is, and how careful one must be when baking it. It can crack easily, and then all your efforts go down the drain. One day I had to make a golden yellow cake, and I didn’t know what to do with the remaining egg white, I thought why not make pavlova? I made the pavlova knowing in my heart that it will fail no matter what. Let me tell you this, my first attempt ever, was a big hit! 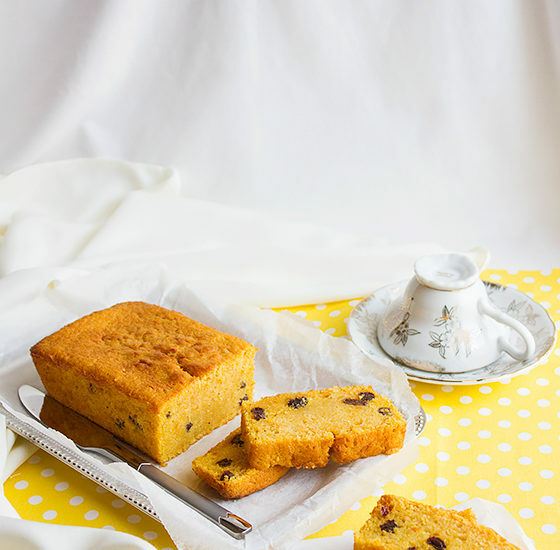 Yes, I was surprised and couldn’t believe it, but just like other recipes, to make a successful dessert all you have to do is to follow few rules and that’s it. Egg whites should be at room temperature. Egg whites shouldn’t have any yolk. The mixing bowl should be clean and dry. Adding sugar starts after beating the egg whites to a soft peak. Add sugar one tablespoon at a time. After beating the meringue for a while take a little and rub between your fingers, if some grains of sugar are there beat some more. 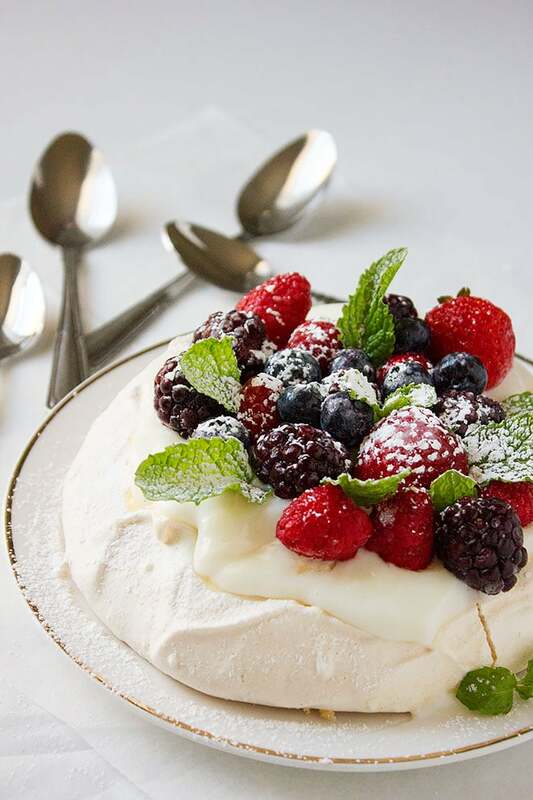 Bake the pavlova in low heat. Never open the oven door while baking the pavlova. When baking is done, open the oven door ajar for up to two hours. 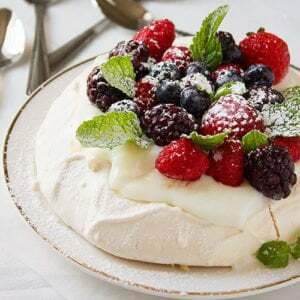 Last but not least, and this is not a tip nor a rule, if your pavlova cracks it’s not the end of the world it will still taste great, so take it easy! I do not use whipping cream on my pavlova; I prefer adding either vanilla or orange pudding instead. 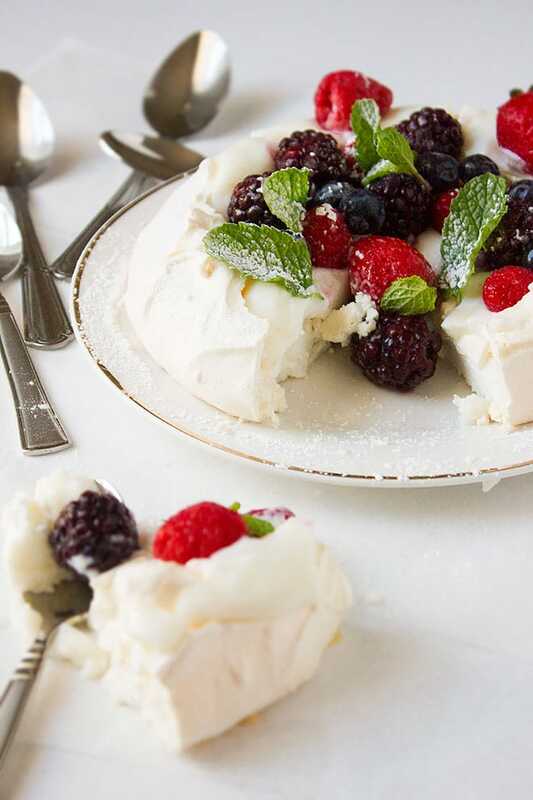 Impress your family and make a pavlova! 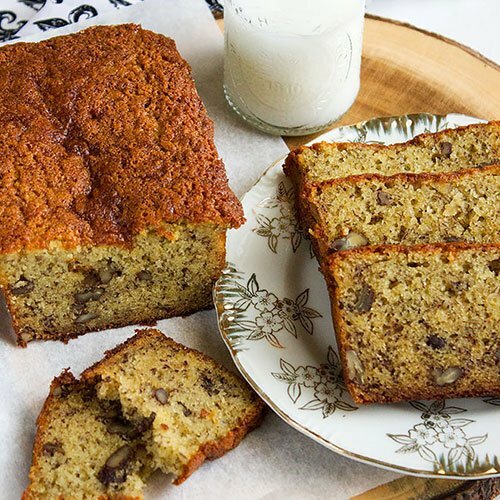 A classic recipe for a delightful dessert made from scratch with easy to follow steps. 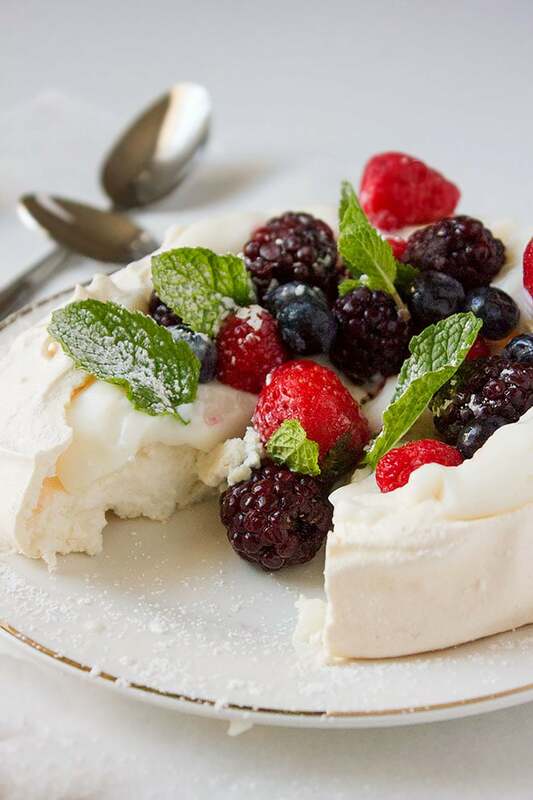 Serve the Pavlova with fresh fruits. 2 large egg whites at room temperature. make sure no yolks are there. Preheat oven to 340F/170C. 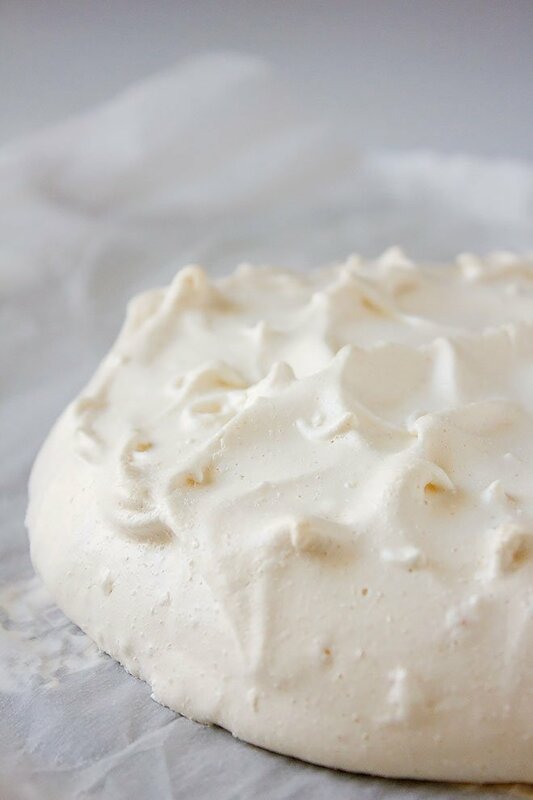 On a parchment paper draw one 6” inch circle OR two 4” inch circles if you want to make individual pavlovas. In a dry and clean bowl, add the egg white and beat on high speed until you reach a soft peak. Add the sugar one tablespoon at a time and keep on beating on high until the mixture is glossy and creates a stiff peak. Take little meringue and rub between your fingers, if you find sugar grains beat some more. Add the vanilla, vinegar, and sifted cornstarch, beat on low speed for few seconds. Remember the parchment paper we prepared earlier? Flip the parchment paper on the baking sheet. Place small dollops from the meringue on four corners under the parchment paper to help it stick to the baking sheet while baking. Place half of the meringue on the parchment paper and try to shape it into a circle using your drawing as a guide. Place the other half of the meringue on top and smooth the edges, make sure that the edges are slightly higher than the center of the meringue. Place the baking sheet in the oven and reduce the heat to 240F/120C. Bake for 1 ½ hour. During the baking time DO NOT OPEN THE OVEN or the meringue will fall flat. When the time is up, turn off the oven and open the oven door slightly (maybe around an inch), stick a wooden spoon to keep the oven door open until the meringue is completely cooled and that might take up to two hours. The outside of the meringue will be pale white and crispy, the inside will have the look, taste, and texture of marshmallow. 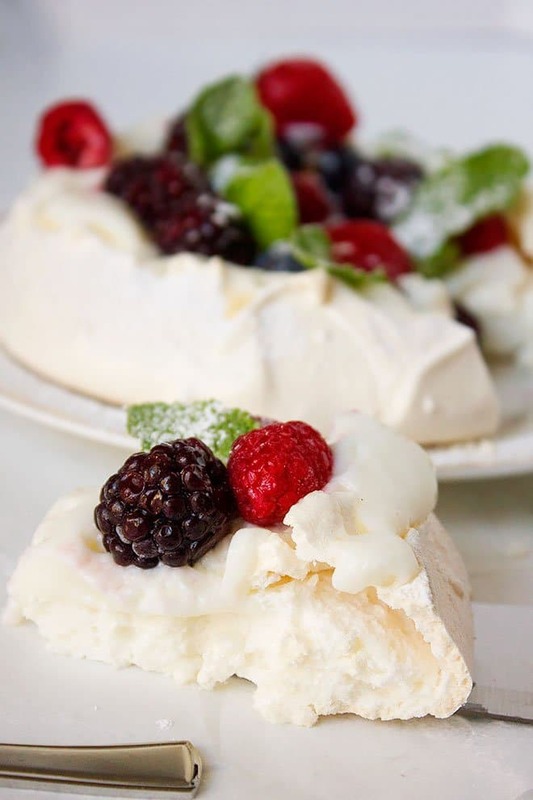 I do not use whipped cream on my pavlova, I prefer using vanilla or orange pudding, so gently spoon the pudding or whipping cream over the pavlova and add your favorite fruits. In a cold bowl add the cream and sugar, beat until fluffy and thick.